Investing in financial education, newsletters, books and courses is an important way to gain confidence in your investing goals. Whether your ultimate goal is to manage all of your investments yourself or work more effectively with your broker, investment knowledge is valuable. The resources and concepts outlined here are designed for novice investors seeking to learn more. If you are a professional seeking to become a Chartered Financial Analyst, you may find more merit in analyzing raw financial data directly and other advanced investment techniques. Whatever your financial goals, you would do well to explore some of the industry's best investment newsletters. Value Line, founded in 1931, is one of America's longest running investment research and advisory services. The firm publishes both free and paid investment newsletters for clients. In addition to broad commentary on the state of the stock market, Value Line also provides recommendations on particular investments. The firm's main free publication, The Dow 30 Value Line Reports, provides commentary on AT&T, Coca-Cola, Bank of America, Du Pont, IBM, Intel, Microsoft, Verizon, 3M Company, Home Depot and other companies. 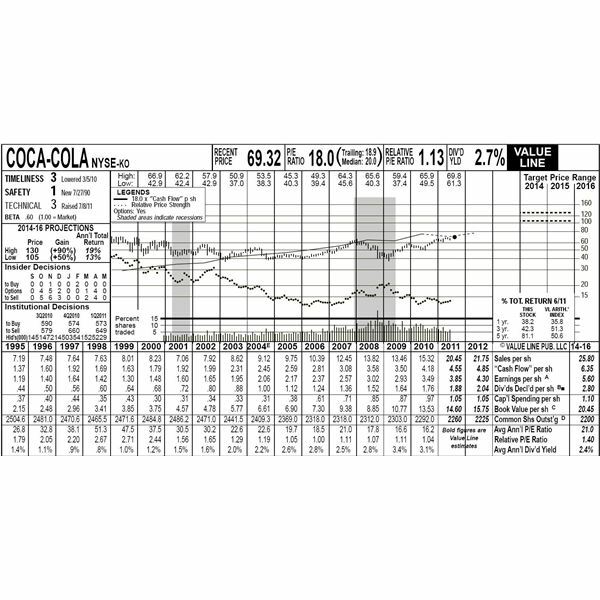 The image below shows a partial report on Coca-Cola. The report itself includes a great deal of financial data. In addition to this data, the report includes forecasts on the company's financial status and recommendations. In order to get the greatest value from this report, some understanding of basic investment terminology such as dividend yield, P/E ratio, and earnings per share may be useful. Reading these free reports is a good way to get your feet wet with investment research. The Dividend Detective is an example of a specialized investment publication, in contrast to Value Line which covers numerous aspects of the investment marketplace. Published by Harry Domash, the Dividend Detective covers stocks, mutual funds, REITs (real estate investment trusts) and ETFs (exchange traded funds) that pay dividends or other regular distributions to investors. Although based in California, Domash has reports and research covering Canadian, Chinese and other international dividend investments. The free content provided on the site mainly consists of high level lists of dividend paying stocks and other securities. Such lists can be a useful starting point for an investor interested in researching dividends. The subscription based content on the site provides market commentary, rankings of stocks and other specialized data. There are many specialized investment newsletters available in print and on the Internet. In many cases, specialized newsletters (and, to a lesser extent, generalist newsletters such as ValueLine) suffer from bias. Critically assessing bias and other potential problems in these publications will be further explored below. In order to get value from these publications, investors need to understand how they fit into broader trends. One of the most tried and true ways to get a broader view of investing comes through more general publications. Choosing a few sources for business and investment sources will help put your investment decisions and other reading material into a broader context. For depth of coverage on investment, the Wall Street Journal and the business section of the New York Times are among the best in the world. The Financial Times, published in the United Kingdom, also provides a window into the financial world. Beyond day to day coverage of the markets, many newspapers also feature coverage of tax issues (a lack of tax planning can easily result in considerable taxes) and examples of numerous investment methods such as technical analysis and fundamental analysis. The more general nature of these publications also means that they tend to be highly accessible to the general public. Now that you have some investment publications to explore, you may wonder how you to make sense of all this information. Keep these guidelines and questions in mind as you review the best investment newsletters. Publisher's viewpoint: Is the publisher or author of the research personally involved in the investments in someway? Personal involvement need not be a liability but it is something to be aware of as you read the advice. Complex terms and data: If you do not understand the writer's data and terms, you should remain skeptical about their advice until you can learn more. Investopedia is an excellent resource to find definitions of common investment terms. Specialization: Investment writers that specialize on a particular category of investments (e.g. precious metals, small cap stocks etc) may be biased about those investments. However positive specialized investment articles are, remember that it is ultimately your responsibility to build a balanced portfolio that addresses your investment goals and risk tolerance. Reputation: When you are evaluating a new investment newsletter or other publication for the first time, always consider the author's track record. On websites, there is usually an "About Us" section that provides background on the writer or the firm's approach. In addition, you should also conduct Internet research on the author to better understand their background.